February is about to hit us like a Mack truck, loves. I want to help us all get through by equipping us with the biggest weapon of mass compassion there is—LOVE. Need some help, a little nudge to reach in and pull some big, impactful love out of your quiver? I thought you might. 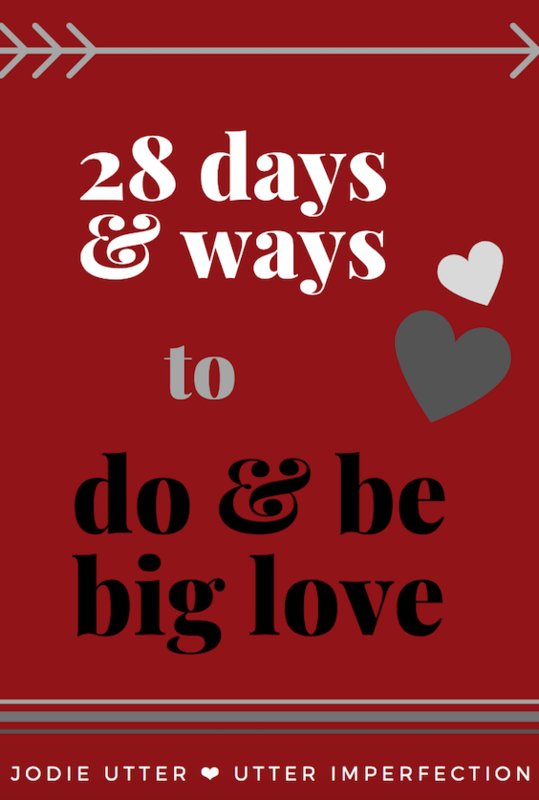 So I’d love to give you my new eBook—28 Days & Ways To Do & Be Big Love—free of charge! If you’ve recently subscribed to my blog, you should have received a welcome and thank you email with a link to your free copy of 28 Days & Ways To Do & Be Big Love. It’s possible that by now you’re already well on your way to four weeks to more free-flowing love between you and yours. But if you’ve already been a faithful subscriber, right about now you might be wondering just where the heck your free copy is. And rightly so! I haven’t forgotten about you, loves. I’m so very grateful for your readership and your camaraderie in this crazy hard but still so worth it life these past two years and I’m saying thank you by gifting you with my new eBook on loving bigger and better, one day at a time. And just in case you’re one of a handful of new subscribers who didn’t receive the link to the eBook due to a little glitch (and all the duct tape and baling wire that I used behind the scenes to get this book to you), I’m including you lovely new folks in this email to make sure one and all who’d like the eBook can get their eyes on it. Here are my first few official book reviews, and um, just, SQUEEEEEEE! “Ready for a February Challenge? My dear friend, Jodie, at Utter Imperfection, wrote an eBook just in time for the new month—28 Days & Ways To Do & Be Big Love. And it’s FREE! Every day offers a new suggestion for how to grow your love. Cuz love gets complicated when you have kids. It gets overlooked sometimes. Or our partner falls down the priority list or we take them for granted. . . I love these tips because they’re so easy. My pet peeve is when people tell me to schedule a date night once a week. Who’s going to pay for THAT? Babysitters are hard to come by these days and not cheap. Here’s the truth—marriage, especially marriage after kids, is hard work. And you probably don’t have time to sit down and read a 100+ book on how to improve your relationship. That’s why I love this e-book from my friend at Utter Imperfection. Seriously, guys, this is a good one. It’s only 33 pages and each piece of advice is one page long. It’s a quick read chock-full of goodness from someone who knows a thing or two about love, marriage, and fighting for what matters. No matter the state of current affairs in your marriage or relationship, what have you got to lose in choosing to work on loving big this month? Nothing of value, loves. Nothing that matters. That’s what! If you’d like to share this book with a friend or loved one, awesome! I’d love that. But rather than sending them the book, please send them a link to my blog. When they subscribe, I’ll happily send them the book to thank them, too. I can’t wait to hear if these tactics buoy and strengthen your marriage like they have mine. Please reach out and let me know if you get something good from the eBook. I love a good love story and I hope you’ll all have a new one to tell at the end of your four weeks to more free-flowing love. Thanks for being here. We’ll talk soon.